Imagine what it feels like when you are next to highest peak of the world raising up to 8848m (4000m vertical) in front of you? It was after the first famous ascend on Everest by Tenzing Norgey Sherpa and by Sir Edmund Hillary in 1953 on the 29th of May. 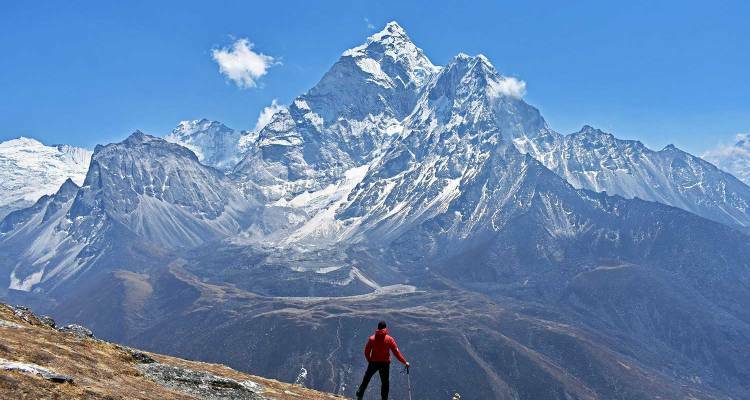 Trek to Everest base camp now has become one of the most famous trek in the world. It is located in north east of Nepal in Khumbu valley. Khumbu valley the land of high mountains, hills old moraines, beautiful pine and rhododendron forests. People living in here are called Sherpas and who are famous for climbing the Himalayas. Everest which lies in Sagarmatha national park is listed as world natural heritage site for its unique and beautiful landscape. 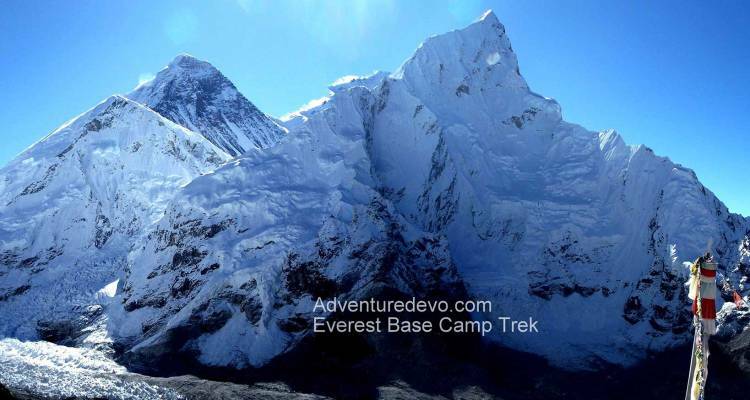 Everest base camp trek offers you that experience with the help from our guidance and well planned itinerary. Our 12 days Everest base camp trek starts with a scenic flight to Lukla at 2840 meters. The trekking trail in Khumbu valley passes through beautiful Sherpa villages, pine and rhododendron forests. Some parts are amazing walking on trail that is as high as 700 meters high from the river below. Walk on moraines to get on the high points for the best views. It is not only the mountains you will see in the trek but visit the old Buddhist Monasteries. An opportunity to see the national bird of Nepal, Musk deer or Snow leopard if lucky. Everest base camp trek or EBC trek offers you the views of 4 peaks highest peaks of the world including may other high peaks. So get ready for trip of a life time. Enjoy the trip with guidance from our friendly and experienced staff. Follow the same route taken by Sir Edmund and Tenzing to get to the top of Everest or to be in Everest base camp. It was great achievement not only for that particular expedition. During expedition season in April, May you will see camps and climbers getting ready to climb. Whether you are single or in group we will help you to make your Everest base camp trek memorable and one of the best travelled destinations. If you have time also look for Three passes trek or Everest base camp trek via cho-la pass. Trek to the Everest Base Camp 5360m, Kalapatthar (5545m) view of Everest 8848 meters. View of Lotse (8501m) 4th highest, Makalu (8463m) 5th highest in the world along with the view of Khumbu glacier and ice fall. Meet the Sherpa people (famous for climbing Himalayas) and know their culture visit famous monasteries in Khumbu valley. Himalayan wild Thar (Himalayan Goat), Musk deer. Starting point: Lukla airport 2840m/93152 foot. Ending point: Kathmandu domestic airport. Total trip days: 15 days, 12 days trek, 3 days in Kathmandu. Trekking difficulty: 3* out of 5, (Hotel upgrade available in client’s interest). Accommodation during the trek: Tea houses/ lodges. Accommodation in Kathmandu: 2* Hotel/ 3nights. Highest point of the trek: 5545 meters/ 18192 foot. Highest peak view: Everest 8848m/29021 foot. Accommodations in twin bed Sharing BB plan basis in Kathmandu for 3 nights in a standard Hotel. KTM International Airport Arrival & Departure Transfer by private comfortable car. Tea house lodge during trekking days. Flight 45 minutes Kathmandu to Lukla and Lukla to Kathmandu. Guide and porter for the trek. Meals for guests during trekking days B, L, D (Breakfast, Lunch, Dinner). All official document process charges including (Everest) Sagarmatha National park Permit, TIMS card. Insurance, Transportation, Wages, Equipment’s and all meals & Lodges for the trek staff. First aid Kit box (for normal treatment only). Government taxes & Other Applicable Fees. Nepal Visa entry fee, please bring 5 passport photos. Travel & Health Insurance – emergency helicopter rescue insurance. Extra accommodation in Kathmandu in case of early return from trekking than schedule itinerary. Any kind of drinks, hot shower and battery charge during trekking or personal expenses. Due to unpredictable weather during winter (January /February, winter and July/August monsoon season, the flights can be cancelled or delayed for few days so we advise you to have few days extra if you are planning for mentioned season, but we still advise you to have extra days for other seasons too, as the weather in Everest region keeps on changing. Trekking difficulty: 3* out of 5, (Hotel upgrade available in client's interest). Everest Base Camp 5360m, Kalapatthar (5545m) view of Highest Mountain Everest. Meet the famous Mountaineers of the world the Sherpas of Khumbu . Visit the world famous Tangbouche Monastery in Khumbu valley. Day 01: Arrival Day: Our representative will be in airport to receive you and after you get to hotel our tour and trek operator will give you information's regarding activities during your stay in Nepal. Day 02: Kathmandu to Lukla (2840m) to Phakding (2630m), 40 minutes flight 4 hours, 100m uphill, 380m downhill, Lodge. Our Guide will come to receive for the early morning Lukla flight, drive to the airport. You will board the early morning flight to Lukla (2840 m) in about 40 minutes. The flight is breath taking with views of the Himalaya and runway which is located in the lap of big mountains. After breakfast in Lukla, you will walk for about 4 hours to Phakding (2630 m), an easy terrain inhabited by Sherpas next to DudhKoshi River. Later in the afternoon, you will follow upstream Dudhkoshi River and spend the night in a lodge. Day 04: Phakding to Namche Bazaar (3440m), 5-6 hours, 900m uphill, 100m downhill, Lodge. Today you will trek for around 6 hours to reach Namche Bazar (3440 m), the famous town in Solukhumbu also known as gate way for Everest. The last three hours of this trek will be tough, but the beautiful sceneries on the way will make you will forget your tiredness. The night will be spent in a local teahouse. Day 05: Namche Bazaar (Acclimatization day) to Khumjung Village, 4-5 hours, 430m uphill, 430m downhill, Lodge. To help your body adjust with the high altitude conditions, we will spend the day for acclimatization. You can do some daytime hiking and explore Khumjung village. Khumjung village is the largest village in Khumbu valley. The village is famous for the old monastery with the Yeti skull inside it. After the khumjung village visit return to the teahouse at Namche Bazaar for the night-stay. Day 06: Namche Bazaar to Tengboche (3830m), 5-6 hours 620m uphill, 230m downhill. Lodge. After a six to seven hours trek, you will reach Tengboche (3830 m), a perfect viewpoint to observe beautiful peaks of AmaDablam and the picturesque Thamserku, and a greater part of the Himalayan range in the Khumbu Region. Dingboche (4350 m.) lies at about a walking distance of 4-5 hours from Tengboche. As we go higher our trekking destination will be less but we will take almost the same time to let our body acclimatize. 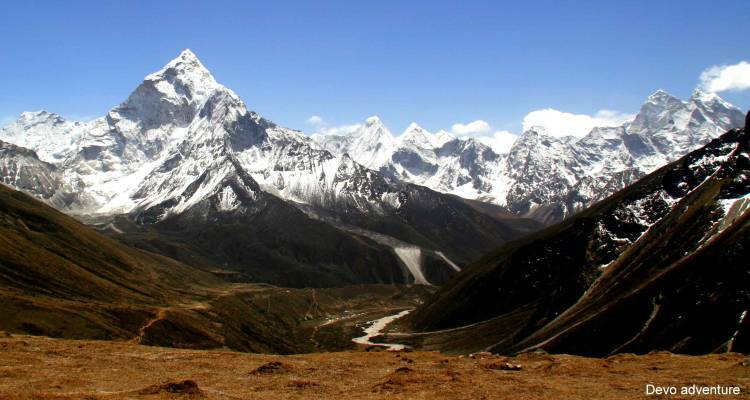 You will pass the villages like Debouche, Pangbouche with a great view of Lotse 8416m and next to Ama Dablam. Day 08: Dingboche Acclimatization day to Chhukung Valley orAmadablam view point (4760m) 710 m uphill, 720m downhill, Lodge. This will be the second day of acclimatization. You will be taken on a day trip to Chhukung Valley and back to Dingboche. Rest and rejuvenation are quite essential for you in order to continue the trekking next day. High altitude treks are usually carried out along with acclimatization in parallel. It is necessary for your body to be familiar with the surrounding altitudes. Frequent acclimatization is a must, and your guides will encourage it. Day 09: Dingboche to Lobuche (4910m) 5-6 hours, 640m uphill, 90m downhill, Lodge. Your next stopover is Lobuche (4910m), at about a walking distance of five to six hours from Dingboche. Stunning views of Mt. Pumori, Mt. AmaDablam, Mt. Lhotse and a section of the Himalayan Range are the main highlights of the day. After some rest you can hike to Khumbu Glaicer for great view. Day 10: Lobuche to GorekShep (5153m) to Everest Base camp (5360m) 450m uphill, 270m downhill, Lodge. The next segment of your trek, from Lobuche to GorekShep (5153 m.) is short and can be completed in about three hours. You will reach GorekShep just in time for lunch. After resting for a few hours, you will take walk to Khumbu Glacier or Everest Base Camp where you can see expedition groups in April/May season, , and ice pinnacles few meters and return to GorekShep. You will have a great photogenic view of sunset on the Nuptse. Day 11: GorekShep to Kalapathar (5545m) to Pheriche (4210m) 462m uphill, 1420m downhill, Lodge. We will begin hiking early in the morning to Kalapatthar View point of Everest, lying at an altitude of 5545 m. If the weather permits, you will get to see a spellbinding sunrise, something you will not find elsewhere in the world. A day to take the photo of Nuptse on the background in GorekShep for Breakfast. Shortly afterwards, you will descend back to Pheriche. Day 12: Pheriche to NamcheBazzar (3440m) 6-7 hours. 570m uphill, 1170m downhill, Lodge. Trek for about 6-7 hours and spend overnight at Namche. Today we will descend to the height of 3440 m, but on the way we will still have to climb for 2-2:30 in average. Day 13: Namche Bazaar to Phakding (2630m) 100m uphill, 900m downhill. Lodge . During the day time, you will trek down to Phakding, which normally takes about five hours. You will have some time to spend in Phakding evening in your lodge or outside in the local area interacting with the locals. Day 14: Phakding to Lukla (2840m) 380m uphill, 100m downhill Lodge. 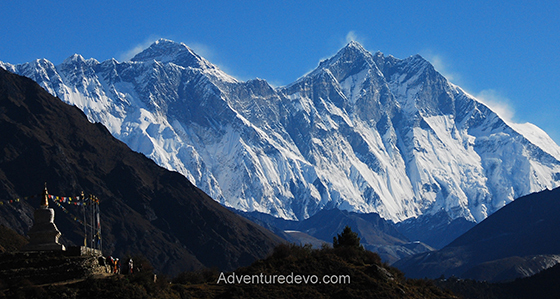 This is your last day in the Everest Region as part of this tour. You will have a leisurely walk back to Lukla. Later in Lukla, you will have lunch and then go for a short walk to a nearby Sherpa village and you can either hop in a local pub for a drink. Day 15: Lukla to Kathmandu: 40 minutes flight. Complimentary massage, Hotel. Early in the morning you will be preparing for your flight back to Kathmandu. However the hustle and bustle of Kathmandu along the way to the hotel will remind of Kathmandu. Complimentary massages from office after you get to Hotel. Last day for shopping before leaving Nepal. Farewell dinner with cultural show..
Day 16: Departure Day: A day to say goodbye and take happy memories back home. Notice: Due bad weather during winter (January /February, winter and July/August monsoon season, the flights can be cancelled or delayed for few days so we advise you to have few days extra if you are planning for mentioned season. If you have any plans for the remaining days in Nepal and you would prefer, lets us know we are always here to help you so that you can enjoy your day by visiting wild life National park or Jungle Safari ,Rafting, paragliding, Sightseeing etc. 02: How can I get to Nepal? 03: Do I need a visa to enter Nepal? All foreign nationals, except Indians, need visas to enter Nepal. Multiple entry visas for 15 days (US$ 25 or equivalent convertible currency), 30 days (US$ 40) or 90 days (US$ 100) can be obtained from any Nepalese embassy or consulate. You can also get a visa on arrival at the Tribhuvan International Airport, Kathmandu or at the Immigration Office at the entry points of Nepal. 04: Do I get visa on arrival? Yes you can, please bring 5 passport size photos and 40 $ for 30 Days Visa. 05: Are there power supplies in main cities of Nepal? Yes there electricity supplies in Kathmandu but there are also frequent power cuts in a day. Standard hotels do have generators as backup power. 06: Can anyone join the trip? 07: What is the basic level of fitness required (Early preparations, mental and physical fitness)? 08: Are the flights to Lukla regular and what happens if the flight gets delayed? Flights to Lukla are operated by few airline companies and should be booked in advance. Due to unpredictable weather so some time the flight can be delayed or cancelled form few hours to couple of days so we suggest you to have few back up days. 10: Food provisions and accommodation? 11: Preexisting medical conditions or allergies? 12: How to reach Kathmandu? 13: Do I need to worry about altitude acclimatization? 14: How many people will be accompanying me on the trip? A maximum of 15 and a minimum of 2 people are advised. For more than 6 people we provide two guides and for more than 12 people in a group 3 guides are provided. 15: What kind of bag should I bring? 16: What will be the weather in Kathmandu, and in the trek? 17: What safety measures will be taken? 18: What will the return journey be like? 19: What is your experience level in doing such treks? A trekking company who have people working in this field for 10- 15 years) who have a great amount of experience doing such treks, as well as trekking to the summit from the base camp. The local guide knows the route thoroughly, hence any issues will also join us and help will be right around! 20: What is the paper work, documentation I need? 21: How does the payment work- Installments/ down payments? 22: How much money to carry on the trip? 23: Will I have mobile network and electricity? 24: How do I charge my phone or camera battery? 25: What if I get really sick or injure myself and cannot continue the trip, will I get a refund for the days of the trip remaining? 26: I am a single, solo woman traveler. Is it safe? 27: Why do I need an extra buffer day on the trip? 29 Do I need vaccination before arriving Nepal? 28: When you book any adventure and holiday trip with us we assume that you have read the full detail of booking term and conditions mentioned in our website and you are full aware of it and you have agreed with the agreement.